A Cyclone called 'Pahilin' is heading toward Indian East Coast at this very moment and is expected to make landfall in less then 24 hours. The landfall is expected impact the coasts of Andhra Pradesh and Orissa and high damage is expected. If you reside anywhere along the east coasts of India you are advised to take necessary precautions as directed by the authorities. 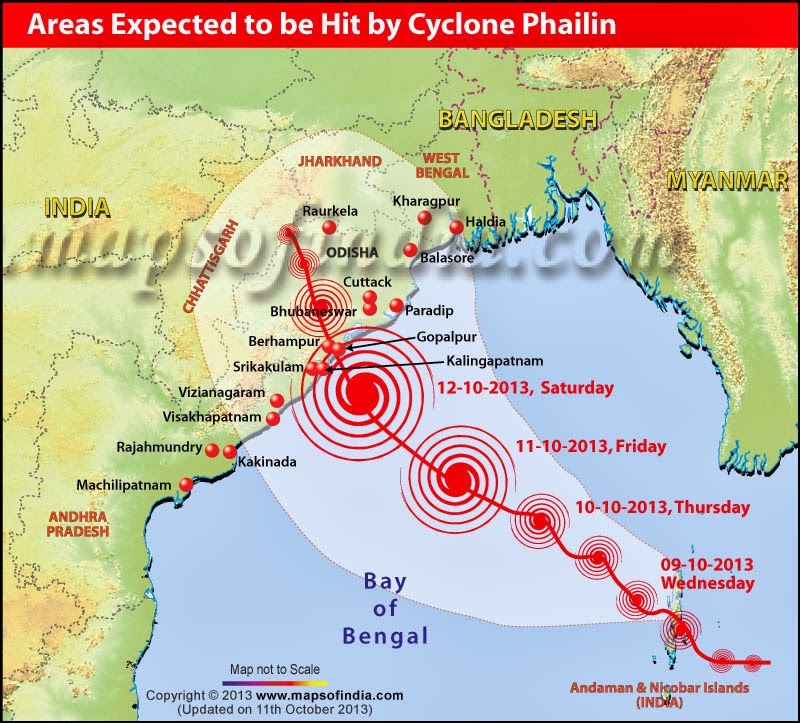 The experts tracking 'Phailin' have predicted that the cyclone could run in with a windspeed in the region of 250+ kmph. The central National Disaster Management Authority, India's nodal disaster management authority has warned that Phailin could effect a population the size of Mumbai across the east coast of India. But the web world is full of good Samaritans who have come up with bunch of resources which can help you in tracking the wrath of Phailin as well as keeping in touch with whats happening on ground. Leading the way is Twitter. 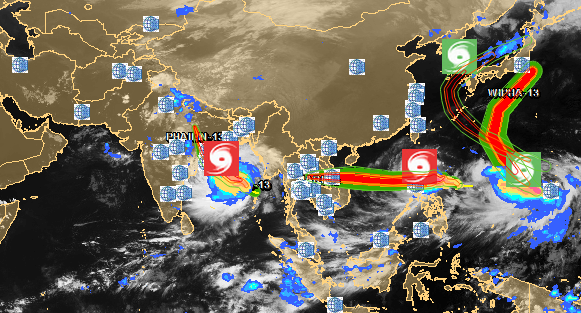 A hashtag #Phailin has already popped up on twitter. This will give you the updates about the Phailins course and images taken by NASA weather satellite. Another website called the Global Disaster Alert and Coordination System has also put up web resources which give you routine updated information by renowned weather experts across the globe. GDACS predicts that the “tropical cyclone is expected to have a high humanitarian impact” on the regions affected by it. You can keep an eye on the website for future updates here or here. Another website which will give your realtime updates is the weather map by the European Commission’s Joint Research Commission (JRC). 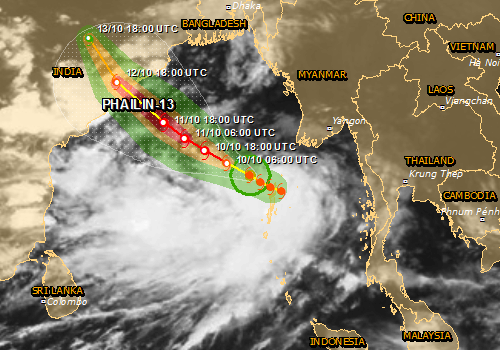 The JRC website here will also give you the projected path of Phailin and the landfall impact zones across the Indian East Coast. The map is interactive and lets you select select different layers over the map. Our own MapsofIndia is also putting out the information about #Pahilin here. 28Storms.com Facebook page here is also very informative. 1. Listen to the radio (All India Radio stations give weather warnings). 2. Keep monitoring the warnings. This will help you to prepare for a cyclone emergency. 3. Pass on the information to others but please do not spread rumours or disinformation. Ignore rumours and do not spread them; this will help to avoid panic situations. 5. When a cyclone alert is on for your area continue normal working but stay alert to the radio warnings. 6. Remember that a cyclone alert means that the danger is within 24 hours. Stay alert. 2. Leave early before your way to high ground or shelter gets flooded3. Do not delay and run the risk of being marooned4. If your house is securely built on high ground take shelter in the safer part of the house. However, if asked to evacuate do not hesitate to leave the place.5. Board up glass windows or put storm shutters in place.6. Provide strong suitable support for outside doors.7. If you do not have wooden boards handy, paste paper strips on glasses to prevent splinters. However, this may not avoid breaking windows.8. Get extra food, which can be eaten without cooking. Store extra drinking water in suitably covered vessels. If you are to evacuate the house move your valuable articles to upper floors to minimize flood damage. Have hurricane lantern, torches or other emergency lights in working conditions and keep them handy. Small and loose things, which can fly in strong winds, should be stored safely in a room. Be sure that a window and door can be opened only on the side opposite to the one facing the wind. Make provision for children and adults requiring special diets. If the centre of the cyclone is passing directly over your house there will be a lull in the wind and rain lasting for half and hour or so. During this time do not go out; because immediately after that very strong winds will blow from the opposite direction.Switch off electrical mains in your house. Remain calm. 1. Pack essentials for yourself and your family to last you a few days, including medicines, special foods for babies and children or elders. 2. Head for the proper shelter or evacuation points indicated for your area. 4. At the shelter follow instructions of the person in charge. 6. You should remain in the shelter until informed that you can return to your home. 7. You must get inoculated against diseases immediately. 8. Strictly avoid any loose and dangling wires from the lamp posts. 9. If you are to drive, drive carefully. 10. Clear debris from your premises immediately.and finally report the correct loss (human as well as material) to appropriate authorities. As an Indian first help who ever requires your assistance without any discrimination. Hope Phailin will rest in peace and spare India. I am praying hard that people be taken to safer places and the impact be as less as possible.